After a trip to the Farmer’s Market, all great adventures start in the kitchen. 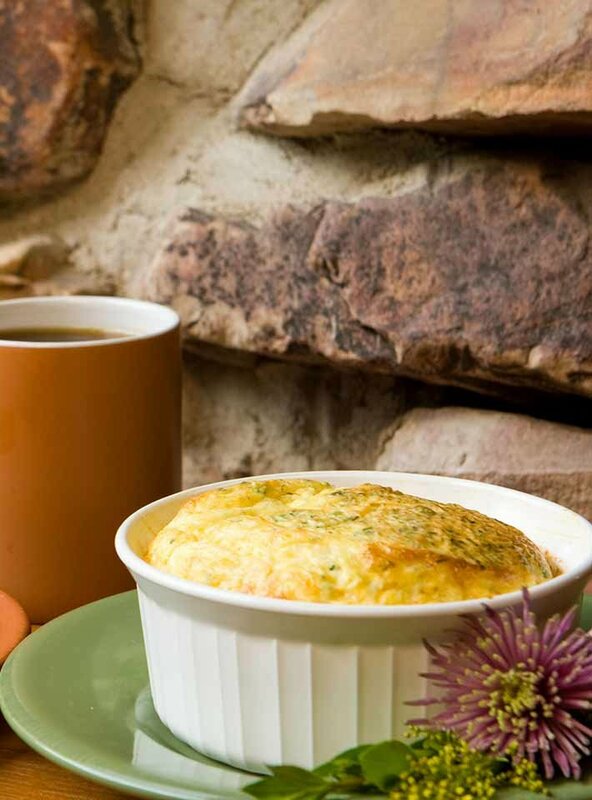 Before heading out on your adventure, begin with Gold Mountain Manor’s freshly prepared gourmet breakfast from scratch. Seated around a communal table dressed in colorful linens, Betsy likes to pamper her guests and evoke an elegant, alpine experience with breakfast service of hand-crafted artisan silverware, an eclectic array of antique china, stoneware, Depression glass in green, cranberry and gold, and earthen ware passed down through the generations. 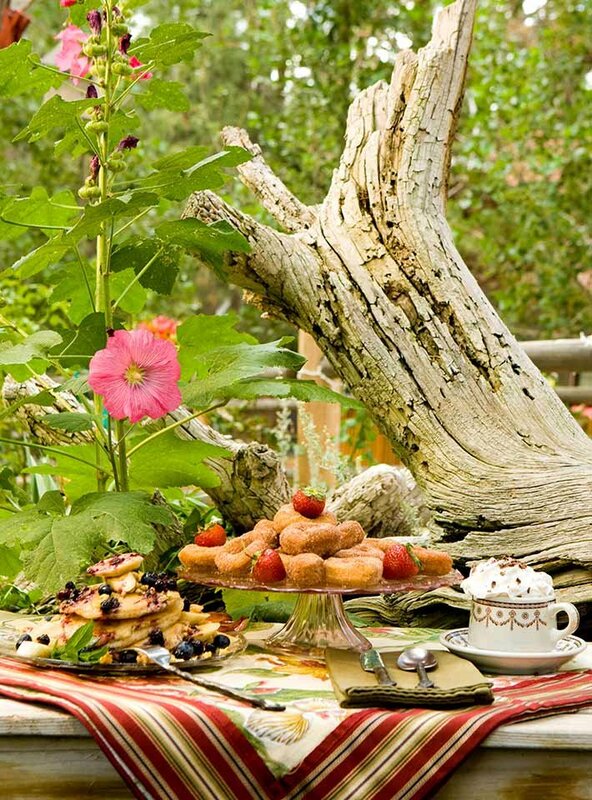 A four-course breakfast follows made from locally grown and in-season fresh produce. Some mornings begin with a yogurt parfait of bright berries or a warm banana crumble followed by one of the Manor’s signature dishes such as a Chili Cheese Egg & Sausage Strata and Roasted Rosemary potatoes; or a savory Herb Egg Soufflé accompanied by a Mascarpone and fresh basil crepe topped with strawberries and drizzled with red pomegranate and balsamic vinegar; Decadent French Toast made of croissants stuffed with fresh bananas and strawberries drenched in a sauce of triple berries and a flavorful Pumpkin pancake on the side; Roasted Portobello Mushrooms topped with scrambled eggs loaded with all kinds of farm fresh vegetables and herbs; Rolled Egg omelets filled with Artesian cheeses, thick cut bacon and sausage or fresh vegetables and herbs in a Red Pepper Coulees sauce. We recommend staying on a little longer so you can enjoy all of Betsy’s creations. 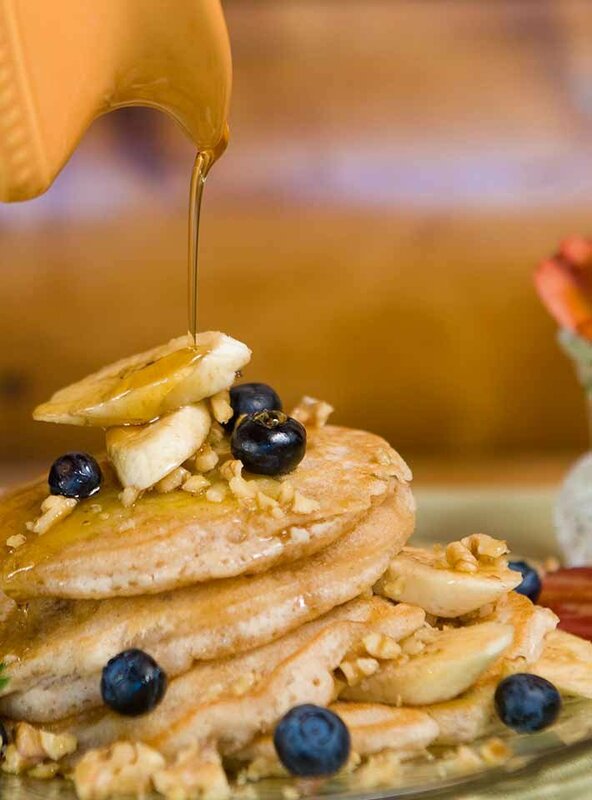 Each breakfast at our Big Bear lodging is so delicious we guarantee you’ll have a hard time picking your favorite. Gourmet coffee and teas are also available along with fresh squeezed orange juice. A special treat of juiced fresh greens, carrots and beets may also be available. Have a dietary restriction or Vegetarian, Gluten-Free, or Vegan? We are happy to prepare special meals for you. Please let us know when you make your reservation how we can accommodate these special meals for you. Preheat oven to 350 degrees. In a large bowl, add butter, sugar, brown sugar and beat together at medium speed until creamy (about four minutes). Add vanilla and eggs and combine at low speed. In a separate bowl, stir together flour, baking soda, salt, spices and sour cream. Fold in oats and chips. Add to batter and mix well. Refrigerate dough for one day prior to baking. Cook bacon and then chop into small pieces. Set aside. In a small saucepan, heat Bourbon to a simmer. Stir in maple syrup. Keep warm but set aside. In a bowl, mix enough pancake mix for 4-6 servings, eggs, buttermilk, pumpkin and chopped bacon (equivalent of 4 slices). Mix well. When this is all mixed, gently stir in the bananas. Over a medium heat greased nonstick saucepan or a griddle with butter or oil, cook the pancakes until done. Top the pancakes with remaining bacon pieces and serve with Bourbon Maple Syrup warmed. Gluten- Free: Use Gluten-Free pancake mix and substitute coconut milk for buttermilk. Preheat oven to 375 degrees. Mix all ingredients together in large bowl. Spray all individual baking bowls with non-stick spray. Place ham slices on bottom of individual backing bowls (can leave out the ham if desired). Pour mix into the bowls. Bake in a 375 degree oven for 20 minutes. Place bread, buttered side down, in greased 9-inch by 13-inch baking dish. Sprinkle cooked, crumbled sausage over the bread; add half the chilies on top of the sausage. Scatter the cheese on top of the chilies and top with the remaining chilies. IN a medium bowl, beat eggs with milk and seasonings; pour over cheese and let soak into bread. Cover and refrigerate overnight. Bake for 55 minutes at 325 degrees, until golden brown. Let sit for a few minutes before serving. Slice croissants lengthwise to make a butterfly shape. Slice and mush four strawberries with 1 tablespoon of sugar. Mush the bananas. Spread 1 tablespoon cream cheese on the inside of the bottom croissant half; add the bananas on top of the cream cheese and the strawberries on top of the bananas. Fold halves together to re-form croissants. In a medium bowl, whish together eggs, half-and-half, brown sugar, vanilla extract and a few shakes of cinnamon. Soak croissants in batter for 20 to 25 minutes, let it get soggy. In a skillet, fry croissants on both sides in butter for approximately 10 minutes. Do not cook all the way through. Cook in oven for 20 minutes at 350 degrees until the croissants are puffed up and golden brown. Garnish with remaining berries sliced into fan shapes (leave green hull intact). For berry topping: heat up the syrup, frozen berries and the brown sugar on the stove top. Cook until fully heated. Spoon over croissants and serve immediately.